More and more Western companies are recognizing the potential of the Chinese market. However, in order to successfully operate digital marketing in China, brands need to develop a strategy that fits local trends and fits specific target groups. Whether it is Baidu, WeChat or Weibo, we are your competent and experienced partner for digital marketing campaigns in China. Our experts at our Beijing offices are designing innovative as well as targeted campaigns in close cooperation with our customers. From content marketing (in Chinese, of course) through WeChat campaigns to Baidu marketing, we offer extensive know-how of the Chinese market. From conception and design to technical realization, we provide all components of your marketing campaign in China from a single source. 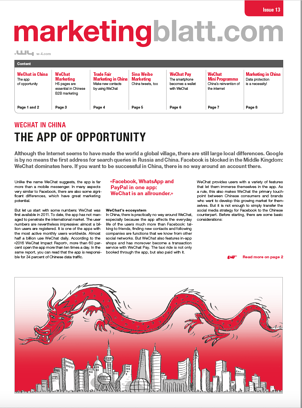 WeChat - an app similar to WhatsApp or Facebook Messenger - provides the perfect platform for your marketing activities in China. It is the most popular messaging app in China and, with its many features, offers far more marketing options than WhatsApp. 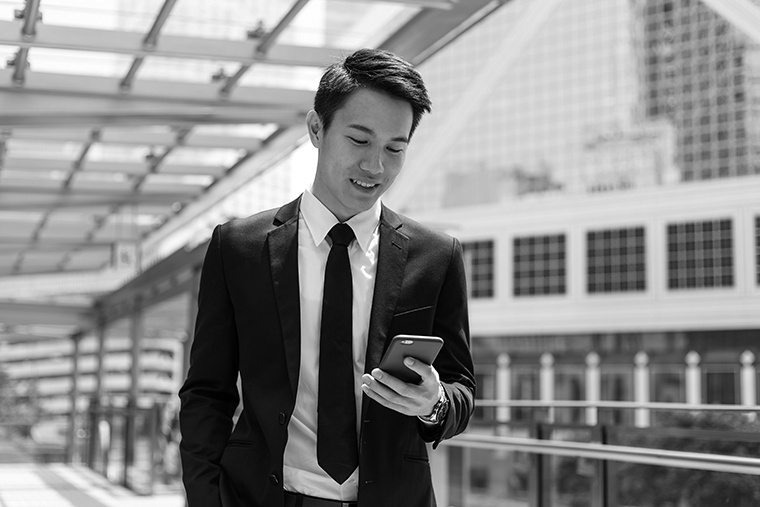 WeChat provides many other options to interact with customers than sending text, image and video messages through APIs. For example, we could arrange sales tickets, competitions and discount promotions for certain products or services via WeChat. The platform is not suitable for mass communication. Users expect individual content. Accordingly, a professional strategy is required. Due to the constantly growing number of users, WeChat is the perfect platform for B2B and B2C content marketing. Organizations can quickly and easily launch campaigns with WeChat and reach a very large number of app users. Brands can create a complete web appearance using WeChat by integrating links to online shops. In addition to links, it is also possible to create a shop within WeChat. Search engine marketing (SEM) is indispensable for companies that want to be among the top search results. Many Western companies make sure that their websites are optimized for a great ranking on Google. Things are different in China, where Baidu is the most successful search engine. Baidu holds over 70 percent market share. Our W4 Marketing experts in Beijing help you to climb to the top of Baidu's ranking. We know the market in China, know what your target audience is interested in and how to best address potential customers in China. Our Chinese marketing staff creates high-quality and search-optimized content in Chinese (the language with the world's most native speakers). Marketing in the age of digitalization requires a systematic, strategic online presence and corresponding campaigns. We realize a professional and targeted online marketing for the Chinese market in line with our motto "Marketing Meets Information Technology". Do you want to learn more about efficient WeChat Marketing in the middle kingdom? Our current edition of our Marketingblatt gives you detailed insights into everything you need to know. Are you having trouble creating an official WeChat account? 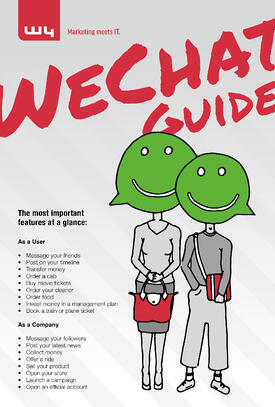 Our brochure will be very helpful since there is a guided checklist to help you create your own WeChat Business account.